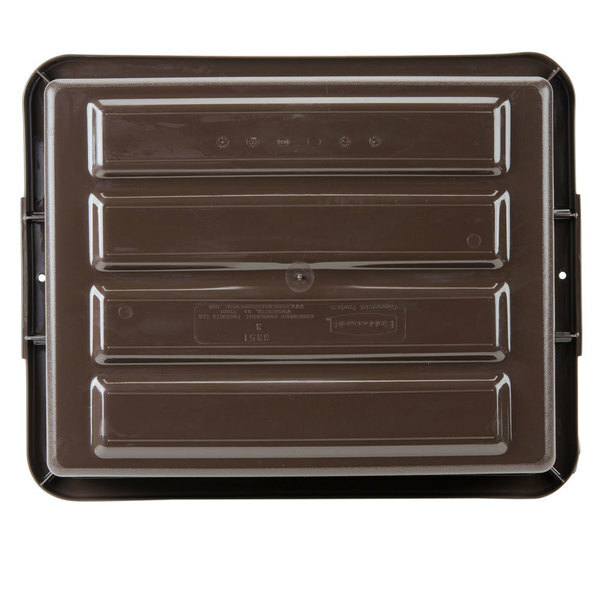 Rubbermaid FG335192BRN Brown Plastic Bus Tub / Bus Box - 21 1/2" x 17" x 7"
The Rubbermaid 3351-92 brown 21 1/2" x 17" x 7" plastic bus tub is equipped with features that make bussing as easy as possible. Don't trust just any bus tub to hold breakable dinnerware! 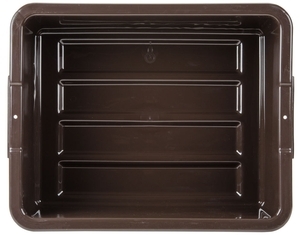 With this plastic bus box, you can rest assured that glasses, plates, and silverware will be transported with ease, thanks to its sturdy and smart design. 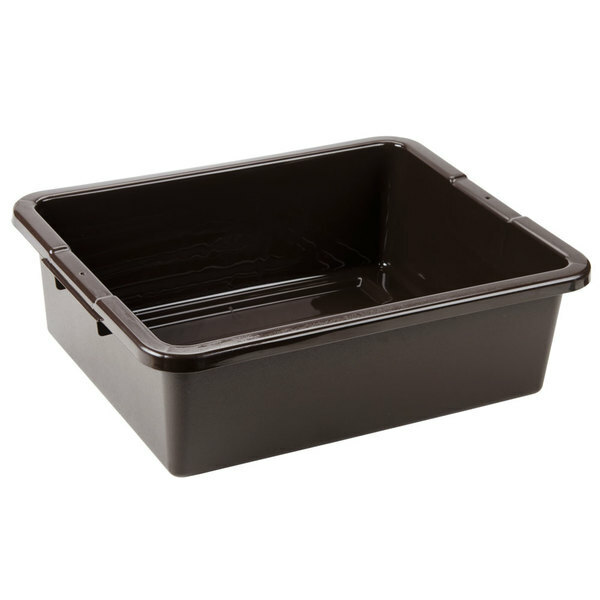 "The Rubbermaid 3351-92 plastic bus tub is extremely durable and great quality like all other rubbermaid products. Easy to carry, stacks well and is easy to clean, no complaints here." 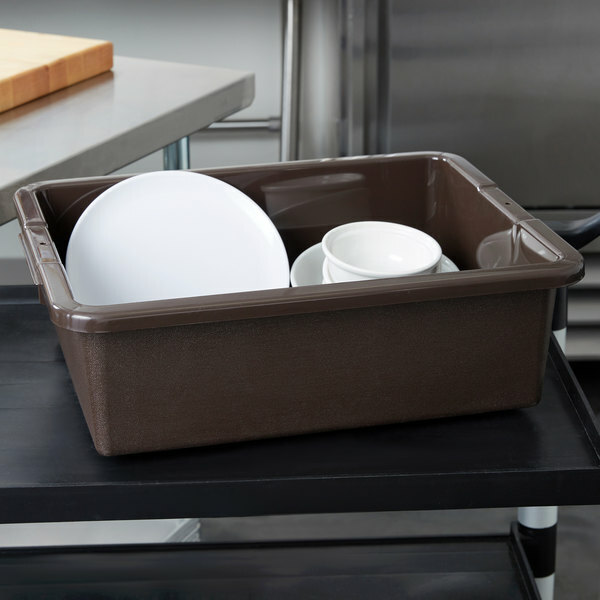 Thanks to the built-in, easy-to-grasp handles, this bus tub makes transporting dishes easy and comfortable! 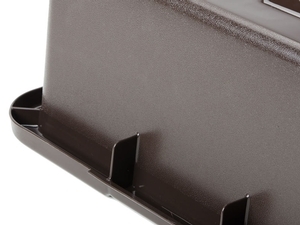 Plus, with a reinforced design, the handles are reliable, even when carrying a heavy load. 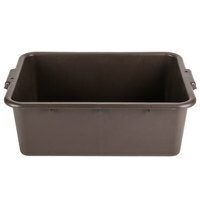 This tub is designed to accommodate heavy dishes or other supplies safely and with ease. Plus, because it's plastic, the empty tub can withstand rough handling. 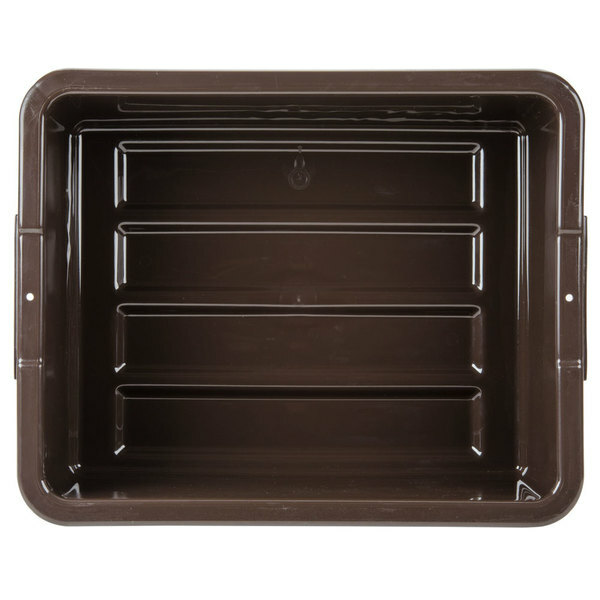 For the safety of your employees and customers, this bus tub features rounded corners. This design also makes cleaning easier and quicker, saving you both time and money. 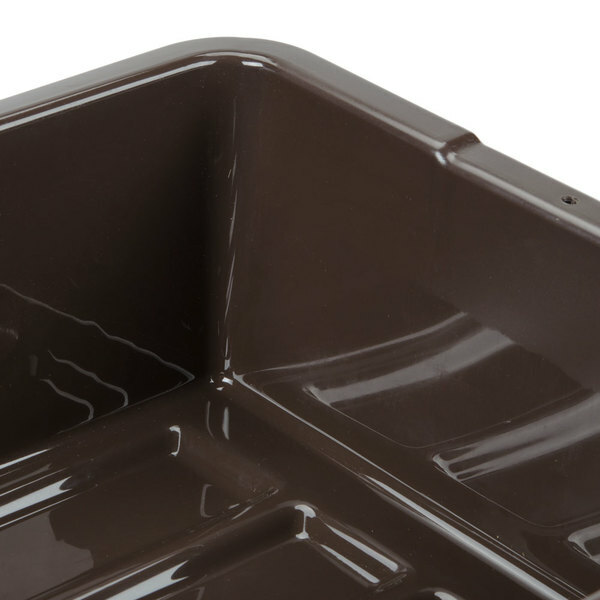 The ribbed interior bottom of this tub helps prevents plates, bowls, and glasses from sliding around excessively during transport, resulting in fewer broken dishes. 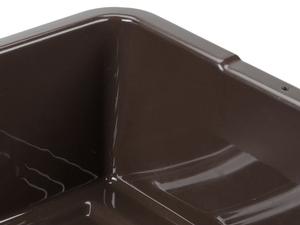 Plus, the ribbed underside matches up with other tubs for easy, non-stick stacking! 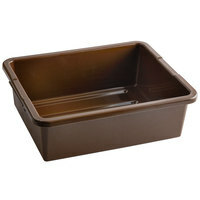 Item #: 70217227BR Rubbermaid FG335192BRN Brown Plastic Bus Tub / Bus Box - 21 1/2" x 17" x 7"
Overall User Rating: Rubbermaid FG335192BRN Brown Plastic Bus Tub / Bus Box - 21 1/2" x 17" x 7"
Rubbermaid bus tubs are great! Super sturdy. We throw super heavy stone bowls in them all day and it seems like the plastic will last all day. Light, durable and cheap. 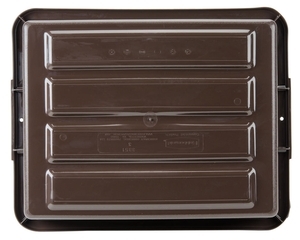 This bus pan gets the job done, making it very easy to transport dirty dishes between the dining room and the kitchen. 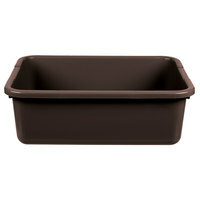 These Rubbermaid brown plastic bus tubs are perfect for our facility. They do not leak, are durable and LAST! They can withstand dishes soaking with detergent and never discolor. They can be easily moved between carts, full of dirty dishes, and never once will you second guess if the handle might break or the base might crack. Great product! 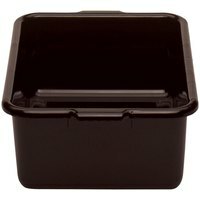 The Rubbermaid 3351-92 plastic bus tub is extremely durable and great quality like all other rubbermaid products. Easy to carry, stacks well and is easy to clean, no complaints here. 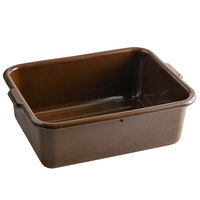 Rubbermaid bus tubs last. They are easy to stack up, Carey around, and easy to clean. Mine have yet to stain and become weak in over a year. Quality product you would expect from rubbermaid. Stacks easily and is easy to hold and carry. Cleans up easy too....just stick it in the dishwasher. I absolutely love rubbermaid products because they last forever. 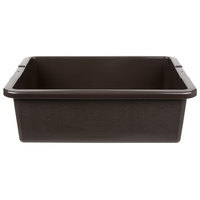 This bus tub is durably made and sturdy enough to hold a full tub of dishes and such. This tub washes easily and they can also be stacked to save space during storage. 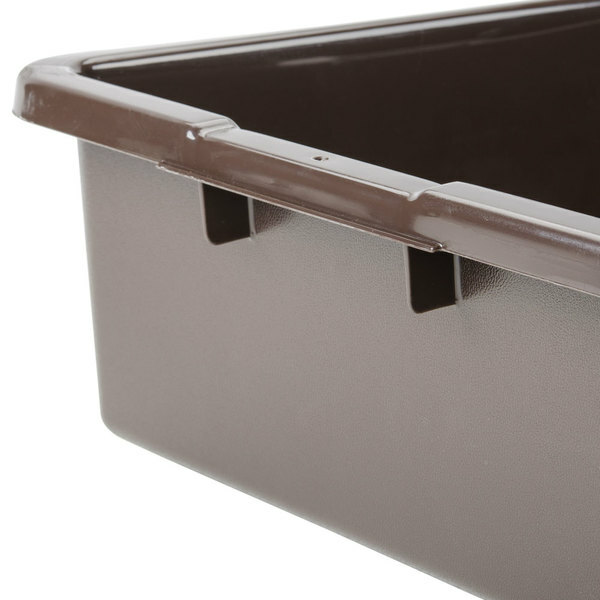 Rubbermaid makes many great great products, and this bus bin is no exception. 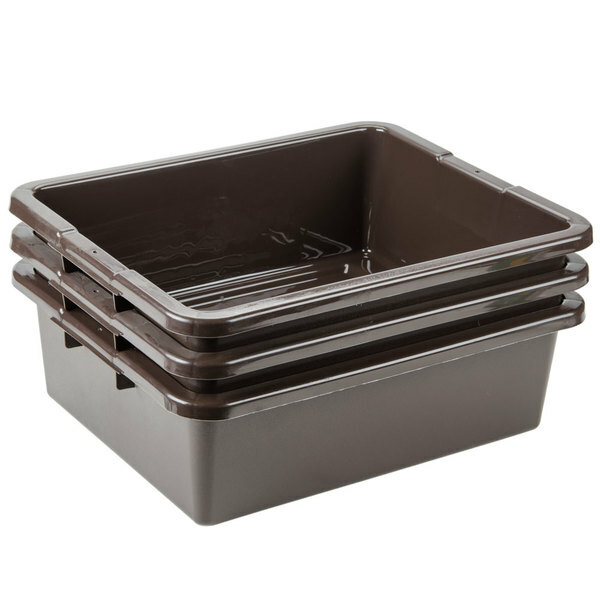 I've used this bus bin at many different restaurants and it is very durable. Very strong handles allows for heavy loads to be easily carried. It's hard to get too overly excited about a bus tub, but this tub is sturdy and inexpensive. Cleans easily and is easy to hold.